Tar spot of corn, a foliar disease caused by the fungus Phyllachora maydis, recently was found in the United States for the first time. The disease was confirmed in Indiana and Illinois. Pictures of the disease and more information about the locations where its presence was confirmed are available online in the Pest & Crop Newsletter (Purdue Cooperative Extension Service) and the Bulletin (University of Illinois Extension). It is important to document if this disease is present in Kentucky. If symptoms similar to those shown in the articles referenced above are found in Kentucky, samples should be submitted to one of the University of Kentucky Plant Disease Diagnostic Laboratories (located in Princeton and Lexington) via a county Extension agent. Interest in producing canola in Kentucky has greatly increased in recent years. During the last canola “boom” in Kentucky during the late 1980s, a serious concern was the rapid decline of stands during late winter and early spring. Referred to as winter decline syndrome, the problem was so severe in some fields that near complete crop failure occurred. At present, it is unknown if newer canola cultivars — with reported improved winter hardiness and survival — will be less subject to winter decline syndrome or not. 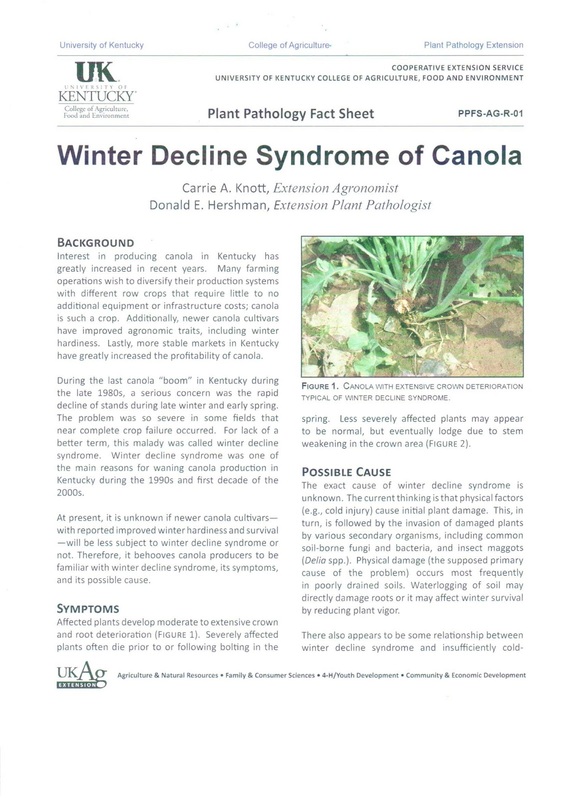 This publication is intended to help canola producers become familiar with winter decline syndrome, its symptoms, its possible cause, and management options. 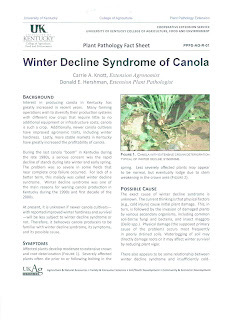 Winter Decline Syndrome of Canola (PPFS-AG-R-01) is available online. For additional publications on crop diseases, visit the UK Plant Pathology Extension Publications webpage. Seeing Orange in Your Corn? The pathogen of southern rust of corn (Puccinia polysora) has infected a lot of corn fields in Kentucky within the last month. 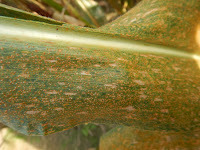 Orange pustules (Figure 1) covering affected leaves are common, and can make your shirt turn orange when walking through a field (which might be good for any Tennessee Volunteer or Illinois Fighting Illini college football fans, but a little disconcerting for corn farmers). Kentucky grain farmers have just started harvesting corn and are getting to the point where they will decide how much wheat they will plant this fall. In Kentucky, wheat is almost always planted in the fall following the harvest on corn ground, and then double-cropped with soybeans in early summer after the wheat harvest. This allows for two harvested crops in one calendar year. 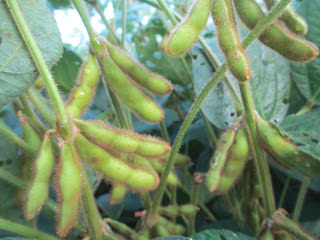 However, soybeans planted after the wheat harvest are more susceptible to summer drought, which means on average yields are lower for these double-cropped soybeans. In Kentucky, this yield reduction typically averages around 20%. As a consequence, the majority of soybeans planted in Kentucky are full-season plantings rather then double-cropped. Seed fill may have been hurt by the hot, dry weather. The wet weather early combined with cooler temperatures set us up for what should be an excellent corn crop. The drier weather recently likely hurt soybean yields. July 2015 was the wettest July on record for Kentucky with almost 9 inches of rain: link. July temperatures were essentially average. The last week of August and first week of September had warmer weather (14 days with average temperatures of 78 to 80 F) and inadequate rainfall to keep up with the temperatures and crop demand link. Who will be the first to document 100 bu/A soybeans in KY? Beginning this year there are two new awards for the Kentucky Soybean Production Contest: Kentucky 100-Bushel Club and Kentucky Double-Crop 80-Bushel Club. Armyworm Moth Captures are Abnormally Large. Recent moth flight of armyworm (AW), in western Kentucky has been much larger than is normal for this time of year. It is not terribly unusual to see problems with this insect on pasture and forage grasses in late June and July, especially in central Kentucky This year’s much larger AW flight during late July and August in western Kentucky is truly unusual. It is difficult to know what to make of this because it has no precedence in our data set. Nevertheless, the fact is they are here. Generally, I would expect to be looking for fall armyworm (FAW), Spodoptera fugiperda,at this time of year, but our moth captures for this insect in both central and western KY have been quite low, perhaps because the cold winter and spring pushed their overwintering locations farther south, and/or they were later beginning their annual northward migration. Even so we have seen some localized but significant populations in south-central KY. The data we see on the armyworm moth flight of course, describes the movement of adults, which are not the damaging stages. It is the juvenile, caterpillar stage that will appear in September that might pose the threat. Moth flights in the earlier portion of the season followed a relatively normal pattern. Our most common problem with AW comes in May on small grains and that is what we saw this year. Also, there is often a small bump in flight in June and July that usually doesn’t amount to much. Those events were relatively normal this year. What is different this year is that following that relatively normal flight in June and July we have another and much larger flight in July and August that will produce caterpillars in September. AW has a very broad host range; it eats on many plants but really prefers grasses. On the whole, corn and grain sorghum should be too close to maturity for much damage. However, late planted soybeans and forage crops, most especially newly seeded forage crops could be in some danger. Producers are advised to keep an eye on very late planted / late developing soybeans, along with forage crops, particularly grasses and most especially newly planted grasses, and grass-alfalfa mixes. There is no established threshold for this pest in these circumstances, but populations around 4-6 worms per sq.ft. probably require treatment.